In antiquity, the secrets of silk- farming were so jealously guarded by the Chinese that the Romans, who only ever saw the finished product, believed silk threads grew on trees. 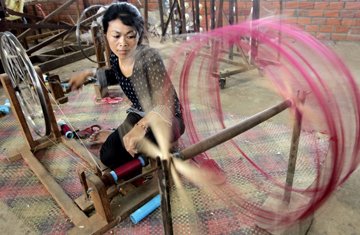 But today, if you want to know how a $70 scarf is spun out of the saliva of the Bombyx mori, or silkworm, all you need do is visit the Angkor Silk Farm, tel: (855-63) 380 375, on the outskirts of Siem Reap, Cambodia. There, you can unravel the mysteries of sericulture by taking a free 30-minute tour around the eight-hectare silk farm and weaving factory. You'll be able to inspect each step of the silkmaking process, from the mulberry orchard that feeds the hungry larvae to the factory floor where young rural women working handlooms turn spools of silk into scarves and tablecloths. The cocooning caterpillars themselves are stored in wicker baskets until, you later discover, they are boiled alive in their homespun abodes. After the tour, you can hit up the gift shop (you'll have a second chance at Phnom Penh airport, where there's another), or you can take a personal two-hour class in silk-weaving or silk-painting if you book in advance. The farm is run by the Artisans d'Angkor, an offshoot of a local training school dedicated to reviving traditional Khmer arts and crafts, and it pays the weavers $150 a month  about as much as some rural Cambodians make in a year  while the tour guides survive on tips. Still, at the end of the day, they all divvy up the ultimate source of this income: the dead worms, which make a crunchy fried snack.